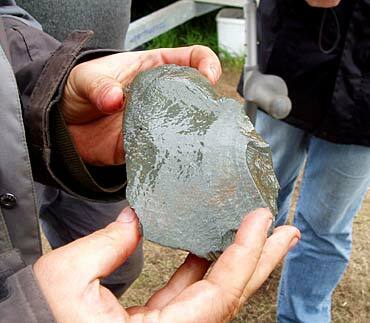 Today’s star find – a stone axe rough out. We’ll start today with the star find – a find that caused great excitement and led to our stone tools expert, Professor Mark Edmonds, being recalled from Kirkwall Airport to give urgent advice. Removal of the central midden over the end of Structure Eight revealed a large chunk of igneous rock, which had obviously been flaked. It is a lovely thing, but sparked off huge interest because it looks very similar to tuff (a type of rock) from the famous Neolithic axe-making factory at Langdale Pike, in the Lake District. Nobody knows this area better than Mark. As Nick, the site director, commented, he has probably carted away at least half of Langdale Pike for his research. Unfortunately, he was at the airport, seeing off Professor Alisdair Whittle, of Cardiff University, who visited yesterday. A quick text brought him rushing back, but a distinctive element within the structure of the rock convinced him that it is probably not Langdale tuff. It is, however, just the sort of rock of which axes were made – perhaps rough out for an axe – and it will be investigated further. As Mark commented, its presence here, as a worked piece of igneous rock, and the presence and working of other rocks, shows that Neolithic people knew a great deal more about geology than we have hitherto believed. Meanwhile. the south end of Structure One gave up a superb, almost complete and rather delicately decorated, Grooved Ware pot. It has been wrapped in more bandages than an Egyptian mummy, cradled in supporting material, packed carefully in a box and will now be on its way to Edinburgh for much-needed conservation work. Most our pottery from the Ness comes out of the ground in pieces, making an almost complete pot an object of great interest. Andrew Appleby’s experimental pottery kiln helps reduce the number of midges on site. And on the subject of pottery, the local potter, Andrew Appleby, is conducting an on-site experiment with a different kiln design from that which he used previously and is firing some of his large, replica Grooved Ware pots. The prevailing wind direction meant that most of the site was well acquainted with the smoky firing and we await the result with interest. In Structure Seven, Georgie has continued to slave away at her, essentially unrewarding, area of ashy spread around the hearth. Today, however, it became a good deal more interesting. 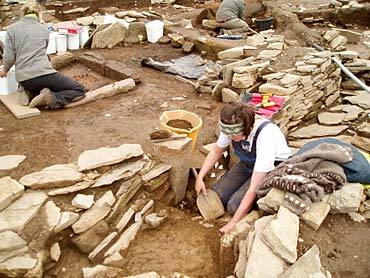 She discovered that an ashy floor surface actually goes under the walls of the structure, suggesting that the hearth was once external to any buildings, before being eventually enclosed. A similar external hearth was noted at the site of Crossiecrown, in St Ola, on the Orkney Mainland. Georgie nears the end of the limitless ashy deposits in Structure Seven. Just to the west of Structure Seven, the removal of the midden uncovered the basal course of the Structure Eight west wall and in Structure Fourteen work continues in removing the sterile clay and rubble area covering the interior of the structure. This has already enabled two entrances to be identified – one in the end and one in the side. Whether these entrances were contemporary is a question yet to be settled. Entrances have also featured strongly in Structure One, where the sequence is becoming much clearer. Three entrances appear to have been in use, but the side entrance is clearly part of the structure’s secondary use and has been, more-or-less, bashed straight through the wall. The south entrance appears to have been blocked and the north entrance seems to have been simply abandoned. Again, their relationship to each other needs clarification. Trish reveals more of the passageway between Structure One and Structure Seven. Back in Structure Seven, Trish has also been exploring the passage which lies to one side of the building. She has discovered that the passageway has been repaved at least twice and this is also leading to greater clarification of the sequence in this area of the site. In Structure Ten, the cleaning and photography has taken place and the team are clearing back material to see more of the nicely defined robber cut in the north-east corner, which will be crucial to defining whether the central chamber had rounded corners in its earlier phase. This is, essentially, robber cut chasing, as opposed to the more familiar wall chasing, but it is proving to be a fruitful approach. In the interests of fairness and accuracy, it should be noted that Sarah is no longer in a bad mood. She says so herself. However, you know those times when people smile through slightly clenched teeth? Final clean for photos in Structure Ten. 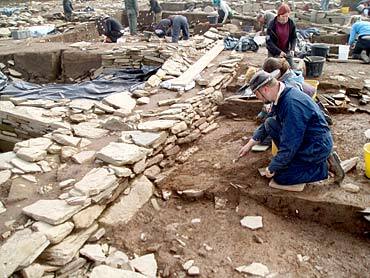 My name is Andy, and I study archaeology at Orkney College. Ray uncovers the basal slabs of the west wall of Structure Eight. 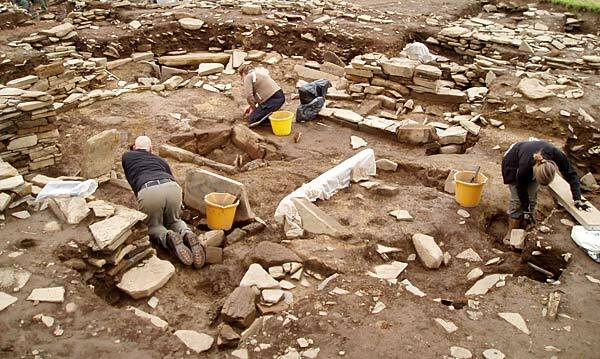 This is my third season on the Ness, only this year the excavation is one of my core modules. 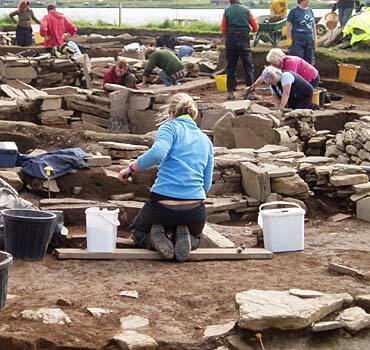 Having previously attended two field-schools (along with a smattering of volunteer work with ORCA, CUNY and Bradford UNI), I must admit that this course has so far been stellar in comparison – but a field-school on the Ness of Brodgar, admittedly, is hard to beat. However, it is not the sheer immensity of the site which creates such an outstanding program – rather it is the level of education and care provided by our supervisors and site director. Students are trained in all aspects of excavation in accordance with their personal level of experience; from the basics of troweling to the more complex (and perhaps somewhat tedious) practices of planning. I highly recommend this field-school to anyone in the position to attend. Last week, I completed the excavation and recording of a half-section in the central hearth in Structure One; following the troweled path of my friend Giles Carey, a graduate of the MA program at Orkney College. Earlier this season, Giles excavated a burrow cut and fill that ran vertically through the south-west edge of the hearth, an instance of bioturbation caused by an unknown creature. Luckily, the majority of the deposits were spared. In the following days, Dr Cathy Batt, from the University of Bradford, conducted archaeomagnetic sampling on the hearth (as well as the hearths in Structure Seven and Structure Eight), which will hopefully provide dates that parallel with radiocarbon samples previously taken on the Ness. 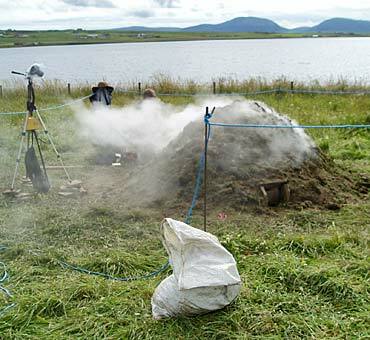 This central hearth has revealed further evidence which may support the theory that the Ness of Brodgar was perhaps something more than a domestic site — this evidence being that the layers of burning are concentrated in the center of the hearth, with perceptible “rake-outs” butting up against the hearth stones. This deviates from other Neolithic sites, whose hearths – once excavated – revealed multiple areas of burning. This suggests that the fires in those sites were perhaps quite small (which one may imagine would be suitable for cooking), whereas the hearth in Structure One might have housed a significantly larger fire. What could the implications of this be? Images of poignant fires with special “spiritual significance” come to mind. Yet we can only question, and attempt to answer with a story based in fact and illuminated by theory – with the ultimate “maybe” – the mystery of it all – forever entrancing and eluding our past, current and future generations of archaeological enthusiasts.